Ideas, like catwalk fashions, come and go in cycles, and so even the worst scientific mistakes will one day be back in some new form, possibly in plaid. Catastrophism, the creationist explanation for the apparent multiple creations and extinctions in the fossil record, once held sway before being utterly rejected. But come back it did, in a new form, albeit one far removed from it’s creationist roots. But so strong was the rejection of catastophism that it took a long time for even a highly modified version to gain any favour. The modified version? The impact theory of extinctions, and the idea that Earth was vulnerable to extraplanatery threats. Soon maps of prehistoric seas were almost solid with hypothesized land bridges – from North America to Europe, from Brazil to Africa, from Southeast Asia to Australia, from Australia to Antarctica. These connective tendrils had not only conveniently appeared whenever it was necessary to move a living organism from one landmass to another, but then obligingly vanished without leaving a trace of their former existence. None of this, of course, was supported by so much as a grain of actual evidence – nothing so wrong could be – yet it was geological orthodoxy for the next half century. Geologists eventually deduced the principles of plate tectonics and land bridges were for the most part cosigned to the same scientific dustbin as aether and miasma. I say for the most part because while land bridges rising and falling has, well, fallen by the wayside, there are examples of land bridges being exposed by falling sea-levels. The Bering Land Bridge linking Siberia to North America is an example. But for the most part moving landmasses (and dispersal) are the standard explanation for biogeographical distributions these days. This is a long and roundabout way to introduce one such biogeographical oddity today. 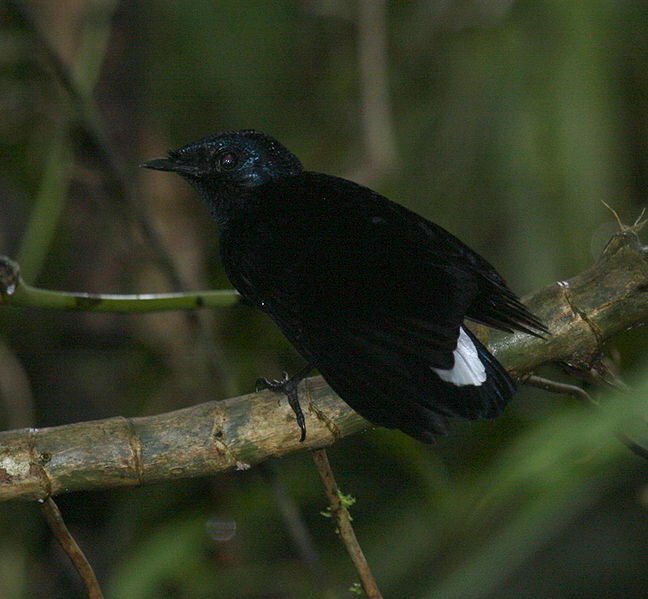 Enter the Silktail, an odd little bird found only on two islands, Taveuni and Vanua Levu, in Fiji. The affinities of this small dark blue bird with a white tail has been a longstanding mystery for taxonomists for a long time. Otto Finsch, when describing the species in 1874, wrote “I scarcely remember a bird which has puzzled me in respect of its generic position so much as this curious little creature”. It has variously been considered a fairy-wren, and Australian robin, a bird of paradise and most recently a monarch-flycatcher. A 2008 paper on the phylogeny of the species and several others came to a surprising conclusion, that the species was actually related to the fantails. Indeed it was part of that family. Until then the fantails were a family of rather personable flycatcher-like birds ranging from India to New Zealand. The family had a single genus and was very conservative in body shape, basically a short dumpy bird with a long fan-able tail and a bucketload of energy. Now they have this long forgotten offshoot of the family, along with another oddity, the Pygmy Drongo of New Guinea. The lineage dates to the Miocene, and in the paper describing the newly elucidated relationships the authors speculate that the group dispersed across the Pacific by making use of “ephemeral island groups”, namely land bridges. Nothing is ever new, and no idea ever loses favour completely! Land bridges? Nonsense. Everybody knows the Silktails were spread by Pirates during their search for new islands while evading rising sea levels as a result of global warming. Super interesting post on the land bridges! And on the bird, of course! Fascinating and fantastically well-written, Duncan. Have scientists ever evoked the lost city of Atlantis to explain unaccountable distributions?